mother's day gift idea no. 01 : lovely letterpress letters. oh, wonderful! what a great beginning to what promises to be a wicked list. I felt in love too with this simple beautiful design. I can wait to give it to my mother. If you are interested, I am doing tabletop design for Mother's day on my blog this week. oh I love that we decided to do the same thing! how neat that we'll have two lists to celebrate Mothers. Paperedtogether is one of my favorites. Thanks for the link to a new-to-me designer, too! I'm with Sulu. Papered Together hits just the right chord with me. 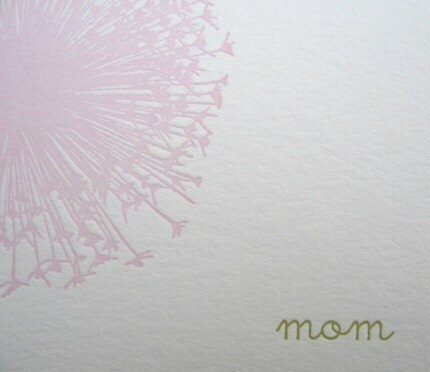 i totally LOVE this card, so simple and pretty.